All brides and grooms (engaged individuals) qualify to enter our Grand Prize drawings. 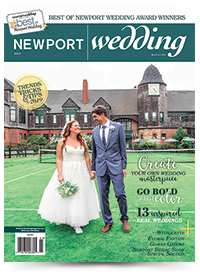 Upon entry to the show, brides- and grooms-to-be will receive a grand prize entry form for each of the 2 drawings, one at OceanCliff and one at Rosecliff. Service for 12 Lenox Registry Package worth at least $5,000 retail! Dishes, flatware and stemware, with winner's choice of pattern from among several choices. Prize package contents and choice of patterns are outlines below, and patterns and pieces may be viewed on wwwlenox.com . Click here for more details and to see the Grand Prize Registry Package! His & Her Wedding Bands worth $5,000 retail! Courtesy of Jason & Co . of Newport. Click here for all the details and official rules. Winners do not need to present at time of Grand Prize drawing, but must visit the Lenox booth at OceanCliff and the Jason & Co. booth at Rosecliff to drop off their Grand Prize entry forms. Must be bride- or groom-to-be to receive an entry form. One form per person (two per couple attending the show together).